While his promising career was ultimately cut short by the burden his large frame (7'6" and over 300 pounds) put on his legs, Yao Ming was a consistent All-Star and true ambassador of the NBA to the now-massive Chinese audience. 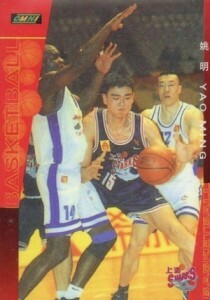 Check out the key Yao Ming cards below, including a look at his many top rookie cards. After several seasons playing for the Shanghai Sharks in the Chinese Basketball Association (CBA), Yao Ming was selected first overall in the 2002 NBA Draft by the Houston Rockets. 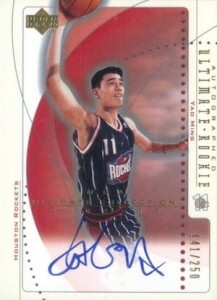 When healthy, Ming was a strong performer for Rockets, averaging 19 points and 9 rebounds per game over his career. However, injuries were problematic and frequent for the big man and he missed the equivalent of three whole seasons during his nine years in the NBA. 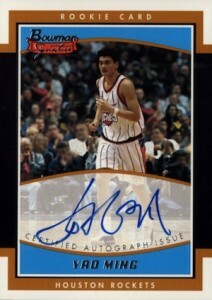 Shop for Yao Ming Autograph Cards on eBay. Buoyed by the support of a massive country, Yao Ming became a basketball sensation and helped pave the way for a whole new segment of fans. While his eight All-Star appearances and five All-NBA selections are nothing to look down on, his biggest contribution took place off the court and this is a huge reason for his Hall of Fame induction. 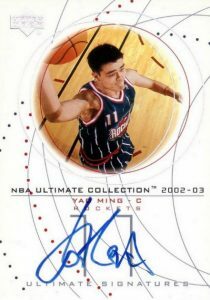 Yao Ming basketball cards were first released in 1999 but really blew up once he made his NBA debut during the 2002-03 season. Although values have cooled since his heyday in the 2000s, these early cards are still his most popular and valuable and should enjoy an uptick in interest now that he has been selected for the HOF. 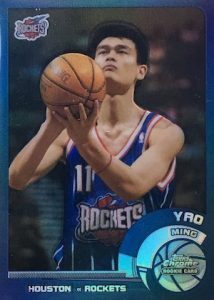 The following list looks at the key Yao Ming cards for collectors to track down with an emphasis on his rookies and autographs. Featuring a young image of The Great Wall of Yao, the very first card for Ming is part of a Chinese release from Omni. Values are relatively low, but true rookies always get an extended look from collectors and that is case for this basic card. 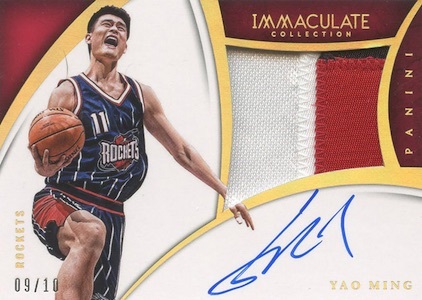 The first of several official rookie autographs for Yao Ming, Bowman Signature Edition delivers with an on-card autograph and moderate print run. There is also a more limited parallel that cuts the total number to 99 copies. As one of the most eye-catching designs, this 2002-03 Finest card is further enhanced with a hard-signed autograph and several Refractor parallels of increasing rarity. Anytime a dark signing area is used, it can make it a bit harder to pick out the signature. 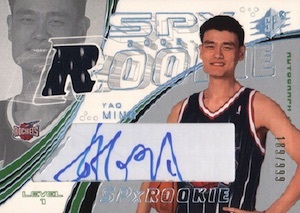 This is clear with the green background for Yao Ming's SP Authentic rookie. Despite this, it still is a solid option for collectors. As one of the more plentiful autographs out there at 1,500 copies, this is also the easiest to find and prices are still reasonable. A Limited version brings that number down to 50 and bumps the value up. 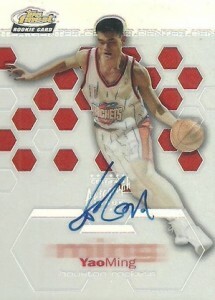 One could argue this is the worst of the Yao Ming rookie cards based on the choppy design and awkward trapped autograph. While this is certainly not ideal, it is still a signed rookie and the added jersey piece sets it apart from the other Ming rookie autographs. Collectors not impressed by the print run of 999 copies can try to locate the Gold Spectrum parallel that is numbered to just 25. 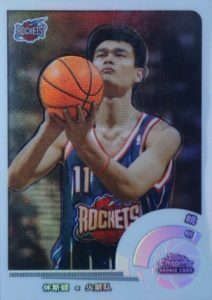 There are actually two different versions of the 2002-03 Topps Chrome rookie card for Yao Ming. The first is a regular base card that is inexpensive and plentiful. The other option is the more limited Chinese variation that replaces nearly all the English text on the front and back with Ming's native language. Both versions also come as various Refractor parallels. The standard card shown below is the base Refractor while the variation is the White Border version. Arguably the top overall option for Ming, Ultimate Collection combines a large on-card signature, strong design and limited run to make an impressive rookie card. With just 250 cards for Yao, these rarely seem to surface. He also has another appealing autograph in the product that is part of the Ultimate Signatures insert. While the two did not experience the same NBA success, Yao Ming is paired with Wang Zhizhi, a fellow seven-footer from China. 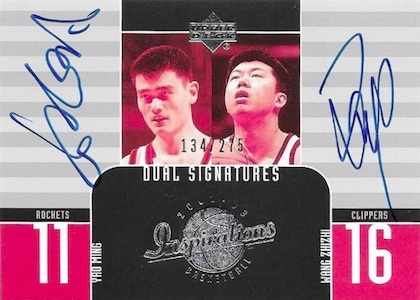 The Dual Signatures card is part of the UD Inspirations brand and features on-card autographs for both. The low print run of 275 copies keeps available options to a minimum. 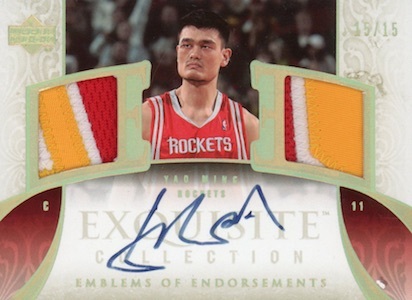 In addition to his rookie autograph options, Yao Ming collectors can also find many premium choices for the Chinese legend. Given the huge increase in high-end brands, there are multiple autographs for Ming that include on-card signatures, premium designs, low prints runs and impressive patch pieces. 2002 Upper Deck Ultimate Collection Yao Ming Rookie RC Auto BGS 9.5 w 10 GEM! !